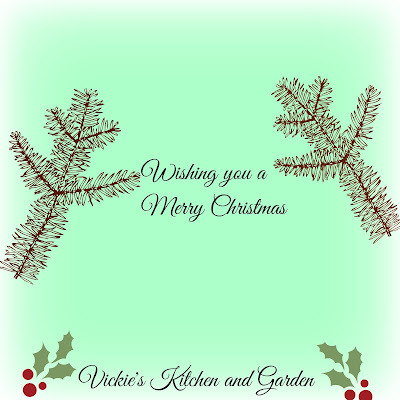 Vickie's Kitchen and Garden: Merry Christmas! Merry Christmas! Today I'm busy cleaning house and I have decided on the menu for Chritmas dinner. It really wasn't too hard because we basically have the same each year. By the way if you have company coming and you need to clean a messy house fast I have some helpful suggestions here. The best part of Christmas though will be watching the grandkids open their presents! What fun! I hope you will have a joyous Christmas! I'll see you on Tuesday!